It’s Friday again! And here I am again to kick off your weekend with plenty of great fanmade merchandise for your viewing pleasure, yay! Starting things off with a large quantity of awesome, we have a set of six hand-painted drinking glasses for $160, with individual glasses available for $30 each! If I didn’t have a terrible habit of breaking glasses, I would be all over these. For reals. Do you like wearing shirts? Of course you do. These shirts are only $13.50 (with the exception of one $18 design) and feature a wide variety of Derpy goodness (plus other ponies, of course), so if you enjoy wearing shirts on a regular basis, there’s really no excuse for not checking these out. And next up is a pretty gorgeous painting of Princess Luna for $70. You can’t immediately tell from the picture, but her mane is done in shimmery paint! I’m not entirely sure why that excites me so much. And then we have this little bundle of cute amigurumi Fluttershy plushie for $45! I just want to hug her, can I please hug her? And listed shortly after the most recent episode (goodness gracious, these plushiemakers work fast!) 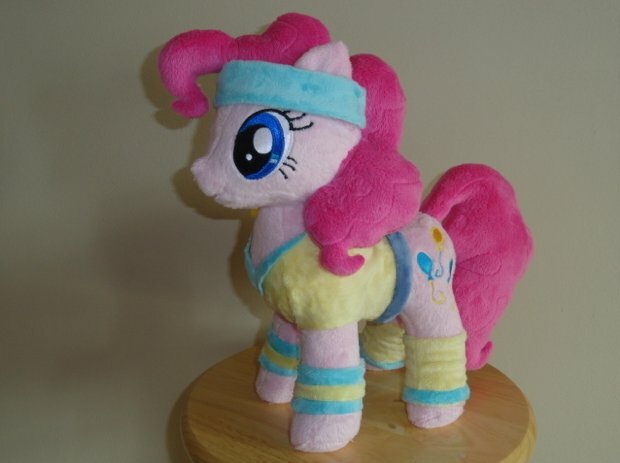 is Pinkie in her workout outfit, which is fully removable! It has one day left and is currently at $305, but I can see it jumping to over $1k at the last minute. In fact, I’ll be surprised if she doesn’t. Next we have another Derpy plushie with even more accessories than the first one! Saddlebags, a magnetized letter and muffins that can be carried in her mouth or hoof, and a voice box. People really are pulling out all the stops with Derpy lately aren’t they? She’s at $200 right now with less than a day left on bidding! And finally, this fabulous fleece Photo Finish plushie! She’s only at $81 at the moment, but there are still 8 days left on her auction. Awsome swag around this time! Another nice Derpy Skymall update. :) I think I may pickup that keychain.